What are the misspellings for partition? 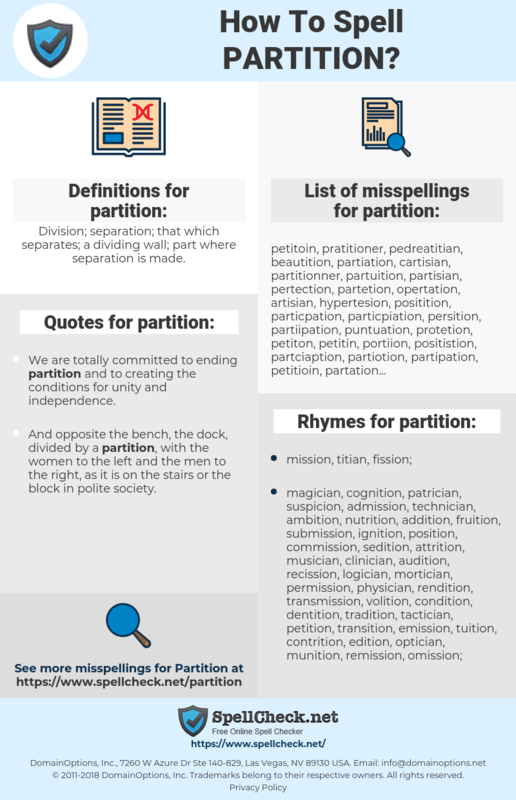 What are the common mistypes for partition? What is the definition of partition? What are the quotes for partition? What are the rhymes for partition? What are the translations for partition? 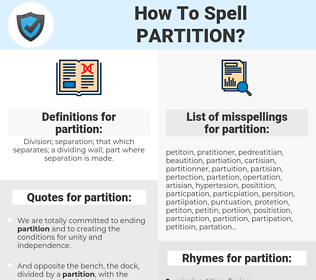 What are the common typos for partition? Division; separation; that which separates; a dividing wall; part where separation is made. This graph shows how "partition" have occurred between 1800 and 2008 in a corpus of English books. 隔, 分区, 隔板, 分治, 瓜分, 隔断, 分隔物. Gliederung, Teil, teilen, Abteilung, Aufteilung, Teilung, Unterteilung, unterteilen, aufteilen, Teilbereich, Aufgliederung, Trennung, Untergliederung, abteilen, Zwischenwand, Partition, Trennwand, Abtrennung, Abschottung, Partitionierung, Stellwand, Raumteiler, Scheidewand, partitionieren. パーティション, 仕切り, 分け目, 隔壁, わけめ, 中仕切, なかじきり, かくへき, かくまく, 中仕切り, 隔膜, >仕切り. reparto, dividir, mampara, separador, partición, tabique, hacer particiones de, compartimentar, pared divisoria, muro de separación, particionar.